The collision between a US and Russian satellite in space highlights the growing importance of monitoring objects in orbit. It also shows that there are still major capability gaps in current systems set up for this task. There are about 17,000 man-made objects above 10cm in size that orbit Earth - and the tally is constantly increasing. This in turn raises the risk of collisions between objects. Richard Crowther, an expert on space debris and near-Earth objects, told BBC News: "It is unfortunate but inevitable, first that we would see such a collision in Low Earth orbit, and secondly - given the number of Iridium satellites in its constellation - more likely that the Iridium system would be affected rather than single satellite systems." Its getting crowded up there. Im amazed that none have hit the space station. Smitty, Im wondering just how close the satellites and the space junk are coming to the Space Station. Its not like they can duck and cover until it passes. I can't seem to pull up http://www.stratcom.mil, but I think the person that wrote that BBC article is off by about 13,000 or more. I have to go from memory on this, but I think StratCom is presently tracking 30 plus thousand objects that are over 10cm in size. I also am wondering what this line is supposed to mean? Is the writer implying that monitoring was not efficient, in this case. I haven't read anything that indicates this was StratCom's fault. It might have been the company's decision not to use the satellite's manuevering capability. I could be wrong in questioning the writer's conclusion, because I haven't really had the time to study this incident, so I'll post a retraction if I find out this was such a surprise that the company had no time to manuever it's satellite and not that it chose not to. Oh yes, I think somebody wrote about the ISS, right? They do manuever for avoidance when given instructions. Been done a number of times. There are, of course, objects smaller than 10cm that can do harm, too. They might not be spotted by StratCom. But, heh, it's space. We're still learning. It's a risk, no matter how hard we try. Might always be. Pilots closer to Earth have accidents and monkeys do fall out of trees. Nothing's a given. Sonic booms and at least one fireball in the sky were reported in Texas on Sunday, less than a week after two satellites collided in space and a day after the Federal Aviation Administration asked U.S. pilots to watch for "falling space debris," authorities said. There were no reports of ground strikes or interference with aircraft in flight, FAA spokesman Roland Herwig said. Herwig told CNN the FAA received no reports from pilots in the air of any sightings but the agency recieved "numerous" calls from people on the ground from Dallas, Texas, south to Austin, Texas. Video shot by a photographer from News 8 TV in Austin showed what appeared to be a meteor-like white fireball blazing across a clear blue sky Sunday morning. The photographer caught the incident while covering a marathon in Austin. Media lead us that said collision was an American collided with a Russia weather station. POSSIBLY is was different & actally two Russian ones. This below, though long, comes from media that deals more with military matters. The two astronauts and one cosmonaut aboard the International Space Station had to duck for cover Thursday as space debris passed perilously close to the orbiting platform. Crew members Sandra Magnus, Michael Fincke and Yury Lonchakov were ordered into one of the Soyuz TMA-13 escape capsules at 12:35 p.m. EDT. In case the space station was hit, the astronauts could have undocked and headed back to Earth. The window of danger passed at 12:45 p.m., and the three crewmembers left the capsule and reentered the space station. At least they mastered "duck and cover". Seems countries that are scooting missles or whatever being dumped from them once up there AND now the space is worse then a traffic tied-up & some accidents in some of the busiest holidays AND no one has figured out how to scoop up said waste to make missels safe. Rather interesting especially with the latest American one with hope it will not be hit when docking. 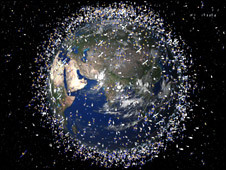 DARMSTADT, Germany - Researchers concerned about an increasing amount of debris orbiting the earth are calling for the active removal of space junk, saying it will ensure a safe environment around the planet. More than 300 scientists and other experts who met for four days at the European Space Agency said Thursday that sharing information is a crucial first step in preventing collisions and predicting with more accuracy where derelict satellites may fall to earth. "We need to share more data," said Thomas Schildknecht of the Aeronautical Institute of the University of Bern. "We consider this most import and challenging part for the immediate future." Even if they find a way to do this I cant see it happening. The cost would be astronomical. Get some big-name sports teams and players together to finance a couple of space junk catchers' mitts to catch the junk. One mitt chases the junk and the other holds the junk until the mitts burn back down on re-entering the atmosphere. Every spring and fall, toss the mitts back up into space to sweep through.